BBC Worldwide has unveiled at Langham Place, its London headquarters, the launch of a global entertainment channel, BBC HD, the company’s first channel produced exclusively for cruise ships and the wider maritime market. It has gone live through Global Eagle Entertainment’s (GEE) MTN TV network, with P&O Cruises and Cunard being the first to offer this to their guests. Shown on enormous screens in the Broadcasting House Media Café, the presentation included a preview of Sir David Attenborough’s latest Blue Planet series. It is true to say the clarity and definition of the sequences were outstanding. Sadly, even on the most luxurious cruise liner, the maximum screen size is 60in and in many cases less. But it will suffice. Also shown were items from ‘Click’, the BBC News Channel high-technology programme. Strangely, they complemented each other. Content on the new channel will cover all genres, ranging from drama, comedy and factual entertainment to natural history and documentaries. Fans of much-loved soaps such as EastEnders, Holby City and Casualty will be pleased to know these will air on BBC HD close to the UK broadcast so they can stay up to date with their favourite shows as they enjoy their cruise holidays. 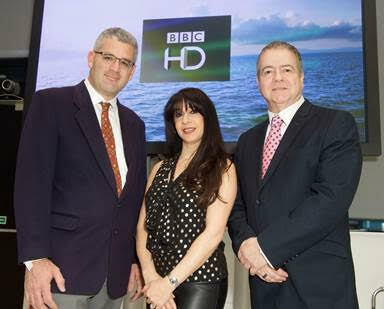 BBC HD complements BBC World News, which launched on MTN TV in 2010 and is available on cruise ships throughout the world. P&O Cruises senior vice president Paul Ludlow said: "We are delighted that our guests will be able to travel the world but still keep up with their favourite television shows for that touch of home. BBC HD will be a superb addition to our in cabin entertainment and I am sure will be welcomed by our guests on both P&O Cruises and Cunard." As the launch customer, BBC HD is now available on all P&O UK and Cunard ships, with the channel also becoming available to the wider cruise industry in due course. A new cruise ship will arrive on the British holiday market in June, CMV’s Columbus. With Marco Polo and Magellan already in the fleet, there is speculation, perhaps for 2019, CMV might just add a Vasco de Gama. Naming ships after the European explorers is certainly in CMV’s vogue. 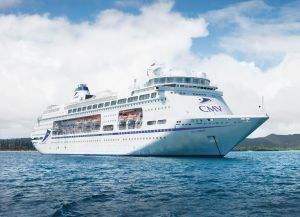 Created in 2009, CMV (Cruise and Maritime Voyages) has quickly built up a fine reputation serving the mid-market and operating out of a number of UK ports. Its main base is London Tilbury, just off the M25 and the QE Bridge, set in a rather bleak landscape but in fact a very pleasant and easy terminal to use. The company offers coach connections from a number of points. Bristol, Cardiff, Cork, Dundee, Dublin, Harwich, Hull, Liverpool and Newcastle all have limited summer programmes. In spring 2015, Carnival Corporation’s former Grand Holiday joined the fleet as Magellan and has been a great success. When when P&O's Arcadia was made available, CMV won the bid and will become Columbus. Under the new ownership, passenger numbers have been reduced substantially from the original 1,910 to just 1,400. Deck space will be no problem if you want to sit out and 150 cabins have been set aside for single occupancy with just a 25% premium. At 63,786 tons, and over 800ft long, Columbus was purpose-built for deep sea ocean cruising and is ideally suited to a programme that this summer will include British Isles circumnavigation, visits to the Norwegian fjords and the Baltic, plus the always popular Canaries. When the weather is fine, there are two heated swimming pools, two whirlpools and a large screen for outdoor movies and sporting events, a first for CMV. Columbus has 775 passenger cabins including 64 deluxe balcony cabins and junior suites. Magellan has only 16 balcony offerings and these go very quickly. Demand will still not probably be satisfied. The dining arrangements on Columbus are largely traditional, with the Waterfront Restaurant for an open breakfast or lunch and two fixed-time sittings for dinner. New are the Fusion and Grill speciality restaurants and, as with Magellan, the ‘Chef’s Table’ speciality dining will be offered. More later in the year when BTN takes a special preview before the maiden voyage to Amsterdam and Antwerp. As a general rule, CMV has a no-children policy; this can sometimes be forgotten for 16-year-olds, although there are no special provisions. With a large well provided ship and nothing like the numbers it was originally designed for, Columbus should be very relaxing. It will offer a choice of seven different lounges and bars, including the Captain’s Club, Connexions, Raffles and Taverner’s Pub and Casino. Two speciality coffee and tea shops will be offered, plus two deck bars. There are six entertainment venues including the impressive three-decked central Atrium, Dome Observatory & Nightclub and two-decked tiered Palladium Show Lounge where the Columbus show team will perform. The Palladium’s retractable stage provides a large floor for ballroom dancing. CMV says a full programme of activities to suit all tastes will be provided. Next January she is off to Auckland and back via Sydney, Hong Kong Singapore and Dubai as the main ports of call. Should be exciting. 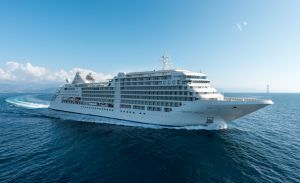 Silversea Cruises has celebrated the successful completion of sea trials by its new flagship, Silver Muse. Construction was entrusted to the Fincantieri shipyard in Genoa, the world’s largest cruise ship builder. Established in 1994 by the Lefebvre family of Rome, Silversea with Muse will have a nine-strong fleet. Silver Cloud was the first ship at 16,800 tons and 296 passengers. She set new standards in terms of passenger comforts and for the first time at sea offered a 24hr courtesy bar to all clients. In terms of layout she was unique, with all the public rooms towards the stern and the 148 suites at the bow end. This gives for a very quiet ship when under way at night. She was followed by sister ship Silver Wind and in 2000 by Silver Shadow and Whisper, with the same general layout, and 28,000 tons and 382 passengers. The next step foward was in 2009 with Silver Spirit at 36,000 tons, 540 passengers and by now the traditional Silversea deck plans. Once you have been on one Silversea ship you should know your way around all of them. Silver Muse is 40,000 tons. Silversea has three expedition ships, Explorer, Galapagos and Discoverer, all with up to 132 passengers, ideal for cruising in the Galapagos and Antarctic. Ahead of its formal christening in Monaco on 19 April 2017, the ship has undergone extensive speed, vibration, noise, endurance and propulsion tests with Silver Muse passing all assessments in accordance with international rules and regulations. “The successful completion of sea trials marks yet another significant milestone in Silver Muse’s development. In just a matter of weeks, we will be welcoming guests from around the world on board the newest member of the Silversea family, with our new flagship set to offer the highest expression of excellence in elegance and comfort at sea,” said Roberto Martinoli, CEO at Silversea Cruises. 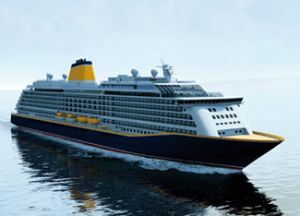 With its present two-ship fleet dating from 1981, Saga Cruises is taking a huge leap forward with plans to introduce a 55,000-ton as-yet unnamed ship in 2019. Design work is well under way in conjunction with the German shipyard Meyer Werft. Artist’s impressions have been released of the liner, which will be launched in summer 2019. The thoughts and recommendations of passengers have been incorporated into the design of the ship, which will carry fewer than 1,000 clients and feature 540 all-balcony cabins. Some 20% of the accommodation will be for solo travellers, with a choice of single cabin grades. Saga Cruises is a spin-off from the London Stock Exchange-listed British company specialising in the over 50s and established in 1959. The cruise division dates from 1996 and has always operated what can be best described as ‘elderly ships’ maintained to a very high standard and offering a level of service perhaps not five-star but of real quality. Clients are offered free transport to their port (normally Dover) and slightly younger people are welcome. Listed in the FTSE 250 Index, the company is very confident of the cruise market future. No build price has been suggested, but $500m cannot be far out and in one sense it is a massive bet that retirees, in the main, will accept what was essentially quality nostalgia at sea, smallish cabins for the most part and balconies that sell out very quickly. The new Saga will be a real 21st-century upscale product. Saga says 75% of current passengers are repeat bookings and has also confirmed that while itineraries for 2019 have not been confirmed they are taking £90 fully-refundable deposits.